Shai Brown shares her evocative poetry. Dan Zampino recalls his heritage. Walnut brings the house down with his beats. 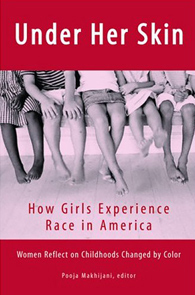 American Race was an event in honor of the release of the anthology Under Her Skin: How Girls Experience Race in America, Editor Pooja Makhijani (Seal Press, Dec. 2004). Patricia Goodwin, writer and poet, a contributor to Under Her Skin: How Girls Experience Race in America, will read her short story from the anthology, "A Child’s Christmas in Revere", which is about the fine line between racial and class injustices. Ms. Goodwin has two books of poetry, Marblehead Moon and Java Love. "A Child’s Christmas in Revere" is excerpted from her novel, Holy Days. Shai Brown, Native American, African American poet and writer, artist, whose life of social service began as a firefighter at age 18 and continued as Director of AgitArte, dedicated to youth, art and positive social change. Mother, artist, activist, her work has been described as "passionate, firey, painful, loving, compassionate and impatient." 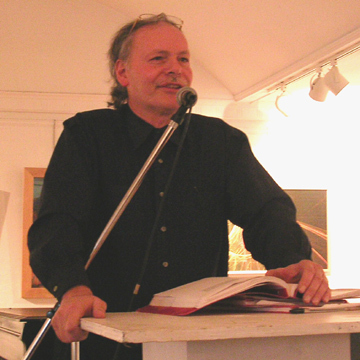 Dan Zampino - Traveler, historian, poet, sculptor whose works focus on the primeval in modern day politics, love, and spirituality, who considers travel a way to knowledge, who is unafraid to provoke controversy with his work, whose devotion to art has led him, with his wife, to create forums for all artists. Walnut, poet, rapper, teacher at AgitArte, took the name Walnut because it symbolized the shell’s hard surface which is the body protecting a very delicate inner being which is the soul. His powerful lyrical music brought him the name, "
Dah Lyrical Geni" The music was stunning and inspiring: Walnut brought the house down at the finish with Angela Masciale's soulful soprano accompaniment on his song "Shell". 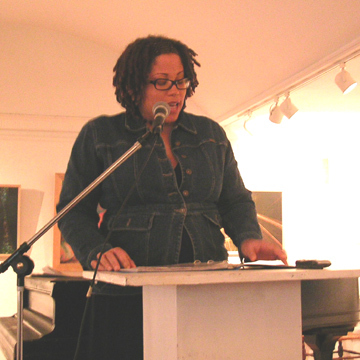 Shai Brown broke hearts with her deeply, painful and joyous poetry. Dan Zampino rewrote our impressions of Ellis Island with his heartfelt account of his ancestors' journey to America. 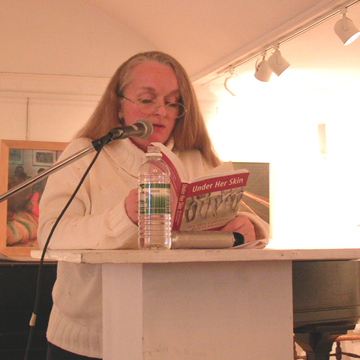 Patricia Goodwin read her short story "A Child's Christmas in Revere", about racial and class injustice, from the anthology Under Her Skin. The crowd was diverse and enthusiastic, giving the host a standing ovation at the finale. All around, the night was a great success, bringing people together with music and poetry. 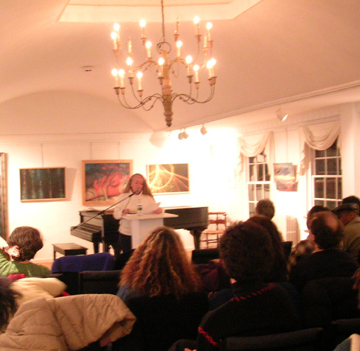 Thank you, all - poets, audience and Marblehead Arts!